Two weeks ago I made this recipe, which made enough candy to go over well at a movie night and an Oscars party. The trick with toffee is to make sure that the butter and sugar don't separate. Fortunately, unlike when you curdle a custard or burn sugar, the separation is treatable. Further notes on separation anxiety below. The recipe is adapted from Anita Prichard's Complete Candy Cookbook, the only cookbook that my library owns. It was published in 1978 and is out of print but, like most books, is available cheaply online. 1. Melt the butter in skillet over low heat. Slowly add sugar. 2. Cook over low heat, stirring constantly with the wooden spoon, until sugar is dissolved and mixture comes to a boil. 3. Clip on candy thermometer. Cook over low heat, stirring constantly. To prevent separation of butter and sugar keep mixture boiling until the thermometer registers 300 (hard crack). 4. Remove from heat and quickly stir in the unroasted nuts. 5. Turn at once into lightly greased pan. 7. With the spatula spread the chocolate evenly over the crunch. 8. If you are suing the roasted nuts, sprinkle them over the chocolate and press down lightly with the spatula. 9. When cool, turn out onto smooth surface and break into eating-size pieces with a mallet (I used a hammer covered with a paper towel). NOTES: I used walnuts with this recipe. 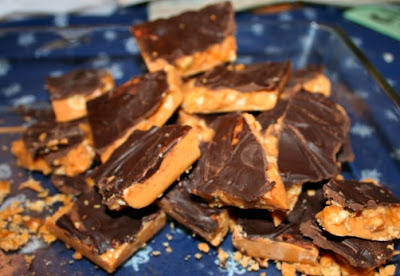 I would use them again: I thought their soft consistency went well with the crunchy toffee. What this recipe doesn't give are pointers on what happens if your butter and sugar do separate, as mine did at one point during the cooking process. For troubleshooting, a Google search lead to a page at Baking 911. The author says to be sure to use salted butter (too late), or to add .25 teaspoons salt per stick of butter. She also recommends adding water 1 teaspoon at a time while stirring gently. Vigorous stirring can cause the mixture to separate. I added salt and water. Not much luck, but I believe they were helpful in the long run. Most websites advise you to turn the heat down in case of separation, but the heat on my stove was so low already that I reasoned it might be contributing to the problem. I turned up the heat and continued to mix slowly. Slowly but surely, the sugar re-desolved into the melted butter. From there, it was smooth sailing. The toffee before I went at it with a hammer. 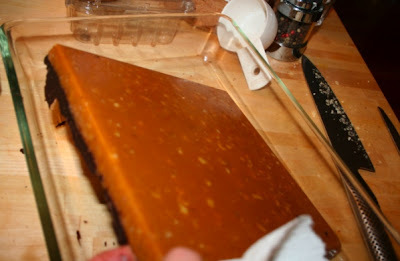 The toffee was a huge success: tasty and attractive. The only unprofessional aspect of the recipe is its instruction to let the heat from the warm toffee melt the chocolate coating. I think the chocolate would have stuck to the top of the toffee more successfully if the chocolate were tempered and the toffee were cold. In that case, I think the best thing to do would be to dip whole pieces in chocolate and then roll them in finely chopped nuts. I'm sure that's the method that the folks at Lake Champlain Chocolates use for their Butter Almond Crunch. Prichard's method certainly was easy though, and for convenience's sake I would probably use it again.